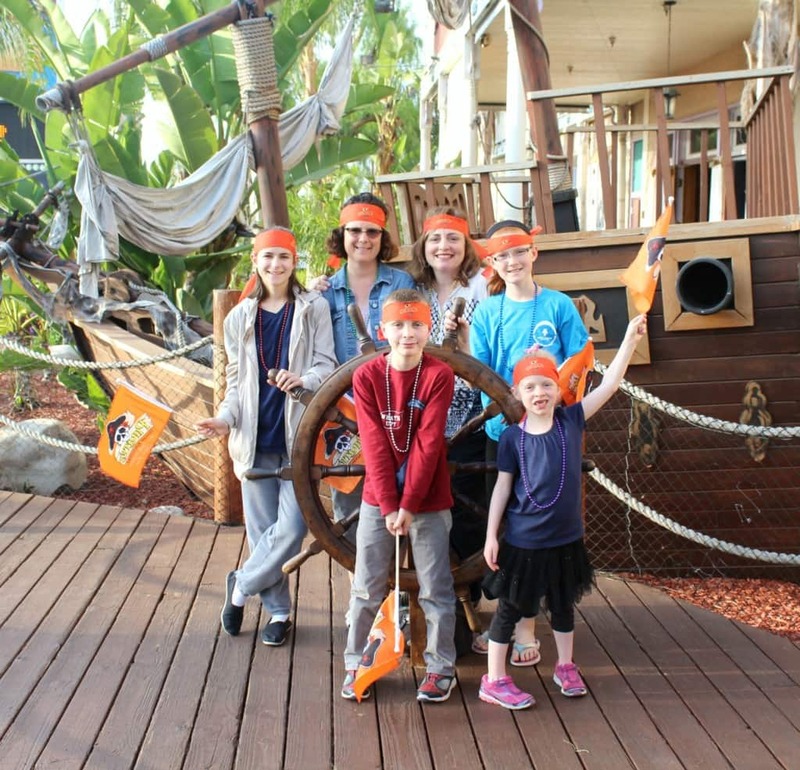 Earlier this summer, my family and I had the pleasure of visiting Pirate’s Dinner Adventure in Buena Park, California. We had an arrr-some time! 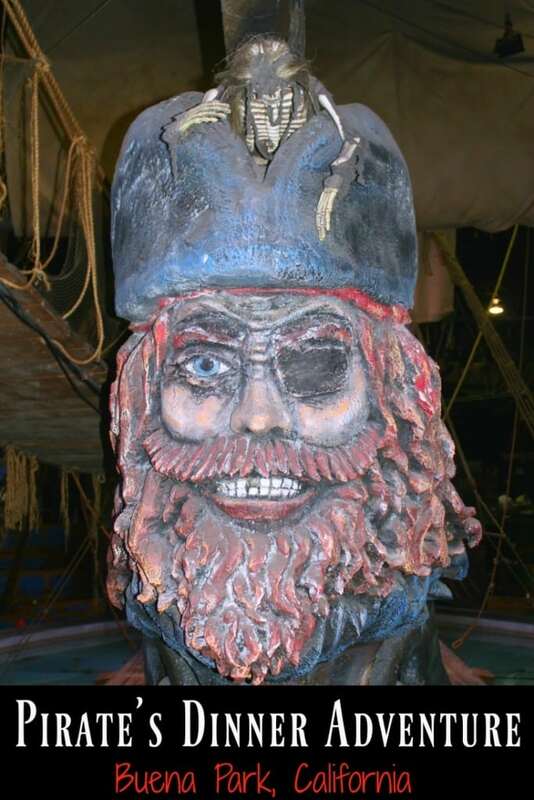 For decades, pirates have been the subject of countless books, movies, and plays. Most people are familiar with Captain Hook in the story Peter Panas, as well as Captain Jack Sparrow in the movie Pirates of the Caribbean. But, do fictional pirates bear any resemblance to the real pirates of the Golden Age? Yes and no. Pirates have occupied the Pacific, Atlantic, and Indian oceans and the seven seas for thousands of years. They were known to attack ships and steals valuables like gold, jewels, and money. Some pirates were even paid to do so! A professional pirate, known as a privateer, was authorized by the government to stop other ships and take possession of their property. Similar to the role of a bounty hunter, a privateer would turn the crew of the ship over to his country. Those captured were faced with charges and even punishment. But by the 19th century the Golden Age of piracy was over. In light of this history lesson, I took my children to see a show at the Pirate’s Dinner Adventure, where history and humor are combined in a live re-enactment. 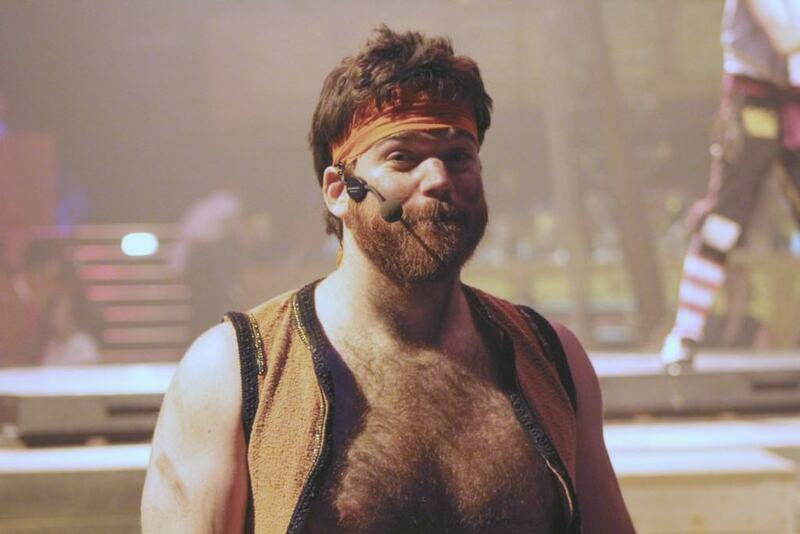 During a traditional show, you will experience more humor. 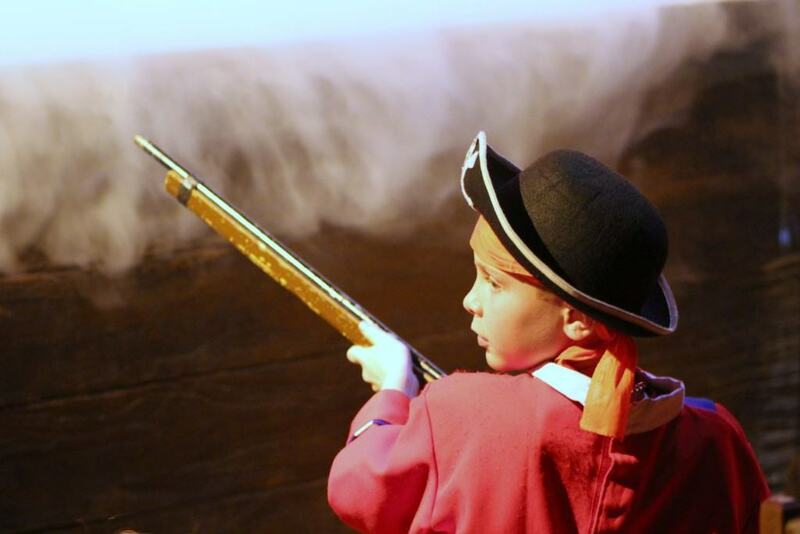 On an educational field trip, you will see how Pirate’s Dinner Adventure blends learning about performing arts and history with entertainment. We started our night off as special guests of the Governor’s Annual Gala – a Pirate’s Dinner Adventure preshow – and we were greeted by the crew and took a family photo together. Inside the lounge, wer were treated to complimentary appetizers such jalapeño poppers, fried zucchini, vegetables served with ranch dressing, fried mac and cheese and sweet potatoes. The theater had a cash bar, souveniors for sale and face painting for the kids for an additional fee. Surprisingly, there were also pirates that roamed about as we mixed and mingled and enjoyed a Pirates Dinner’s Adventure pre-show in the lounge. Once inside the main theater, we sat in the front row and had a spectacular view of the stage. Every seat in the house is designed so people can interact with the live show. 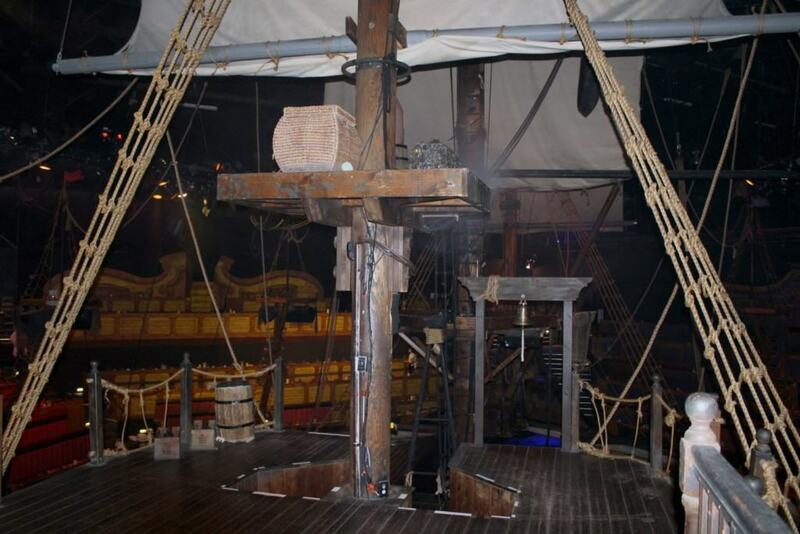 The stage itself is set aboard an authentically replicated 18th-century Spanish galleon measuring 46 feet long, 18 feet wide with 40-foot masts, the ship is anchored in a 300,000-gallon indoor lagoon with night sky lighting. During the Pirate’s Dinner Adventure show, we were served a delicious four-course meal. 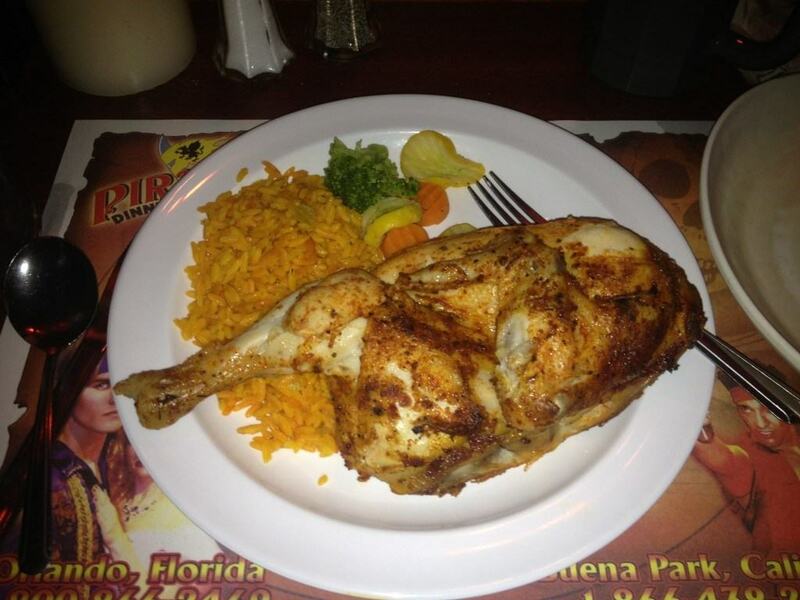 I chose to eat a fresh garden salad, roasted chicken and Caribbean rice. Mr. SoCal Field Trips and Field Trip Boy selected the vegetable soup, barbecue beef kabobs and buttery mashed potatoes. To top it off, they served us a warm fudge brownie a la mode for dessert. 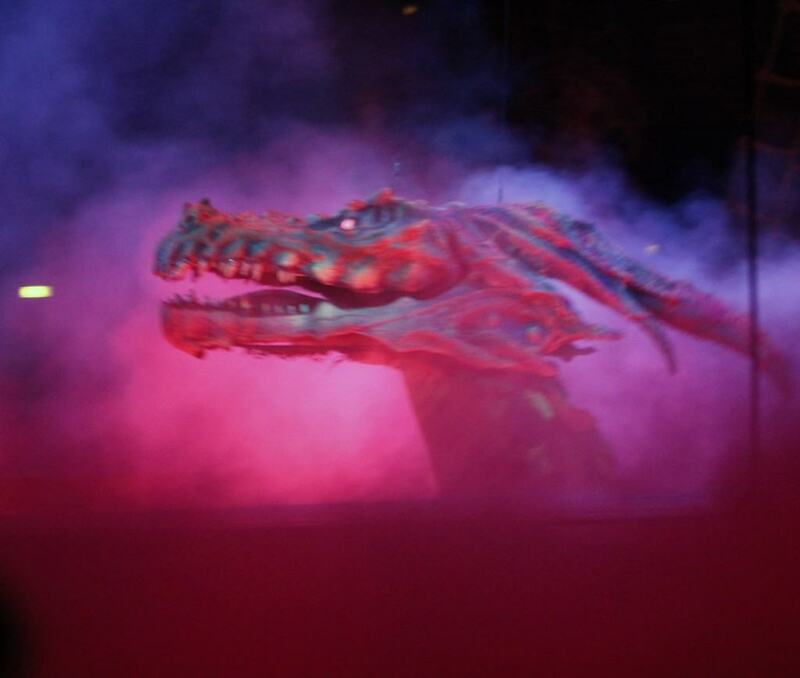 While eating dinner, the Rise of The Sea Dragon show began. 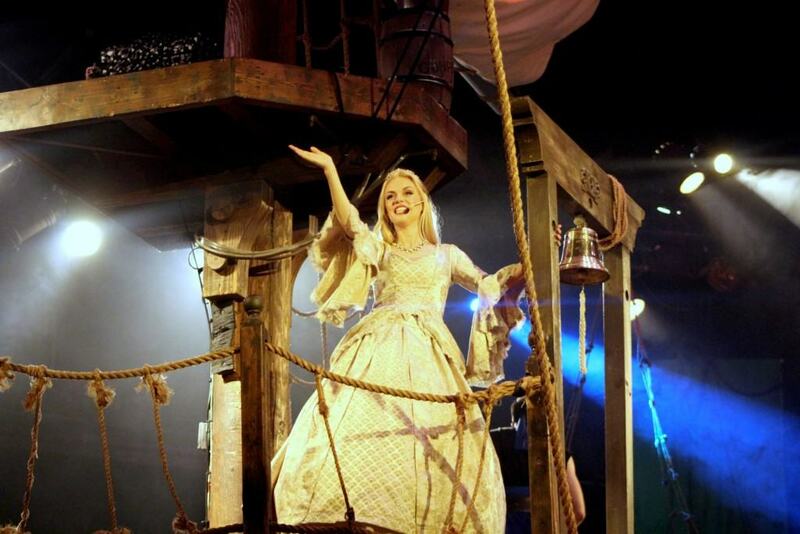 Pirate’s Dinner Adventure puts on a top-notch Hollywood production! The show is intense and action packed. 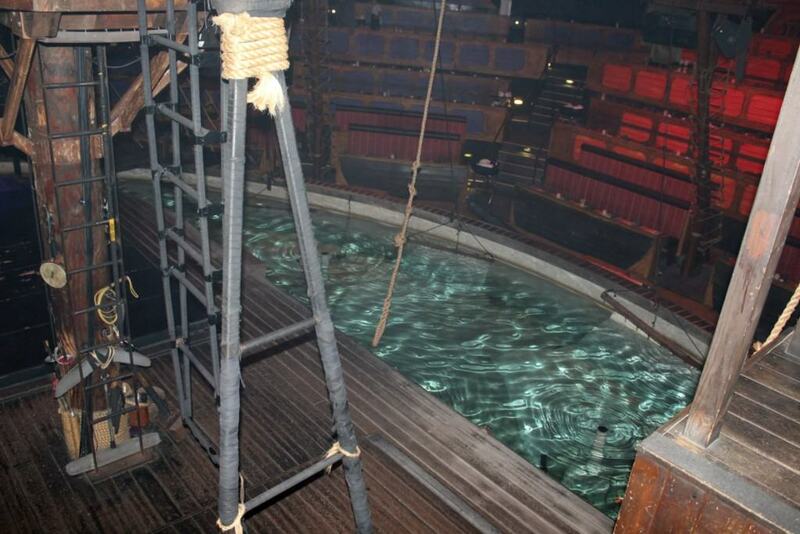 The production team uses a variety of polytechnics, lights and sounds to set the ambiance. The audience is divided into groups of 5 colors: orange, green, yellow, blue and purple. 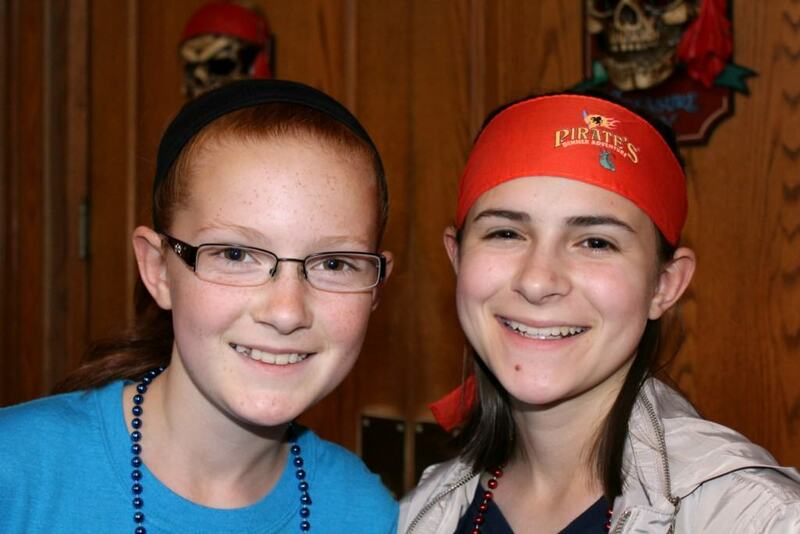 We were on the awesome orange team! A big part of dividing the audiences into different groups is the rivalry and competition, a central theme of the show. 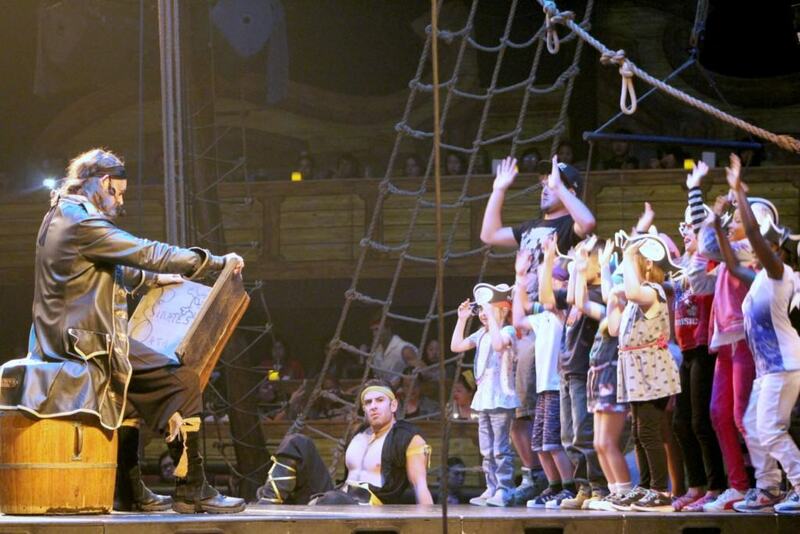 My kids were lucky enough to be selected to go on stage and participate in the show’s production as little pirates. They teased the captain with humorous chants and tried to capture the dragon with pretend pistols. After the show the cast members were very giving of their time and took pictures with guests and signed autographs. 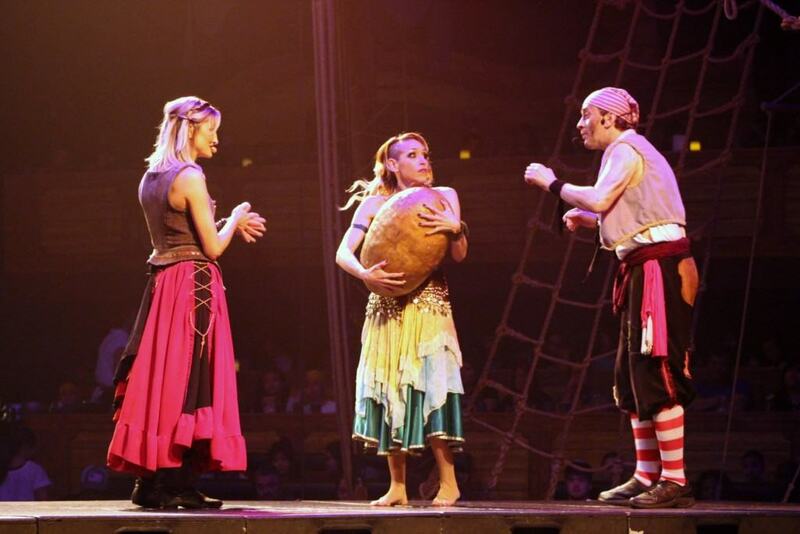 Right now you can get discount tickets to visit Pirate’s Dinner Adventure starting at only $24 through LivingSocial. Normal ticket prices start at $41 per person! Visit LivingSocial.com to get started. Enter your Zip/Postal code and click the “Continue” button. LivingSocial will use this to find deals from businesses located in your area. Click the “buy now!” button when you are ready to purchase the Pirate’s Dinner Adventure. Fill out your personal information or click on the Facebook icon to do it through Facebook. 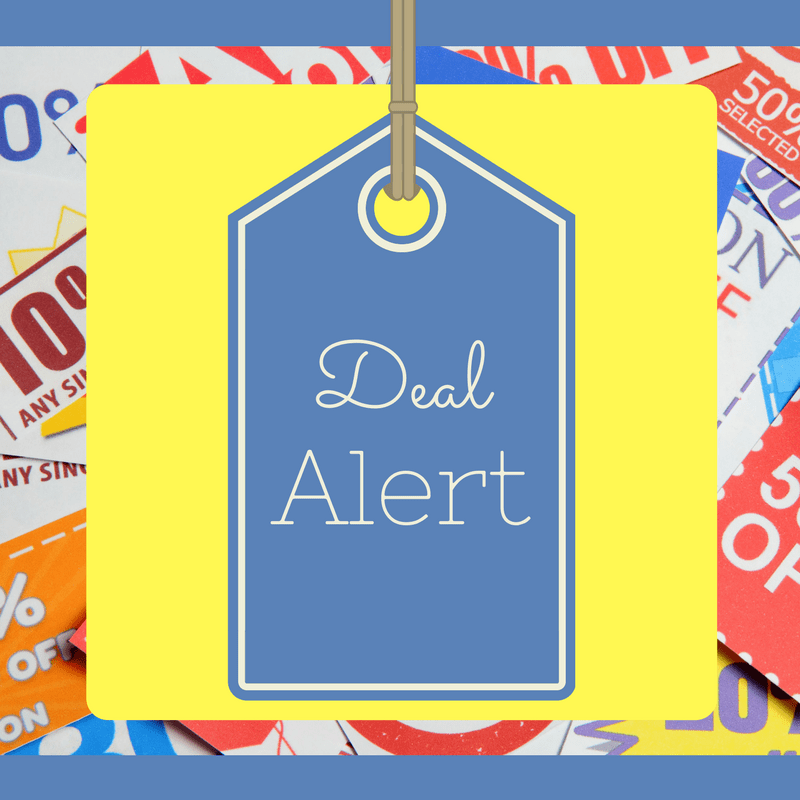 Click the “purchase my deal” button at the bottom of the page to complete the purchase. Now you can either print out your receipt and take it with you to the theater or show your receipt on your cell phone at check in. 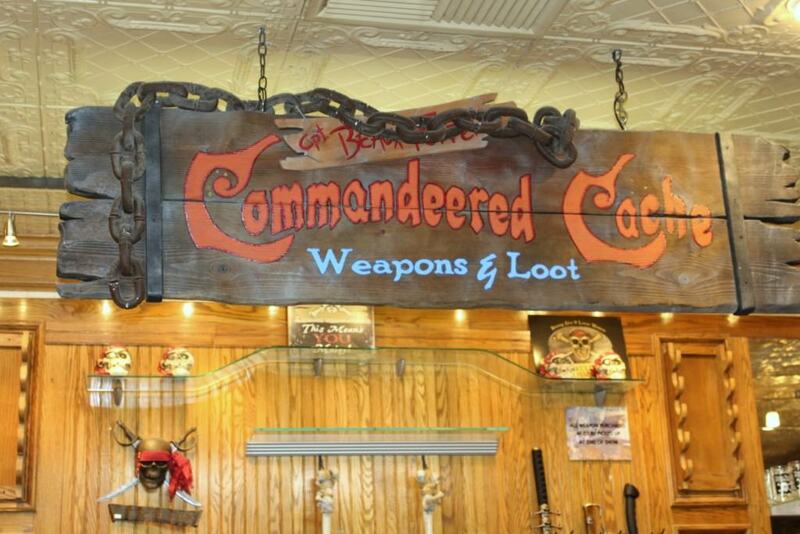 Pirate’s Dinner Adventure is located at 7600 Beach Blvd. in Buena Park, CA. They offer valet parking for $7.00 or self parking for free. While in town, you might also be interested in booking a hotel that is close to Knott’s Berry Farm. Here are a few of my top suggestions. Next to Knott’s Berry Farm Amusement Park, this hotel offers free shuttle service to Disneyland Theme Park, 6 miles away. It features a restaurant and spacious rooms with free Wi-Fi. Every guest room at Knott’s Berry Farm Hotel comes with cable TV and coffee maker. All rooms are warmly decorated with carpet floors and include a safe and air conditioning. Guests of this hotel have free access to recreational activities, including an outdoor pool, a hot tub and a sauna. A sports court for basketball and tennis is available, along with a small gym. 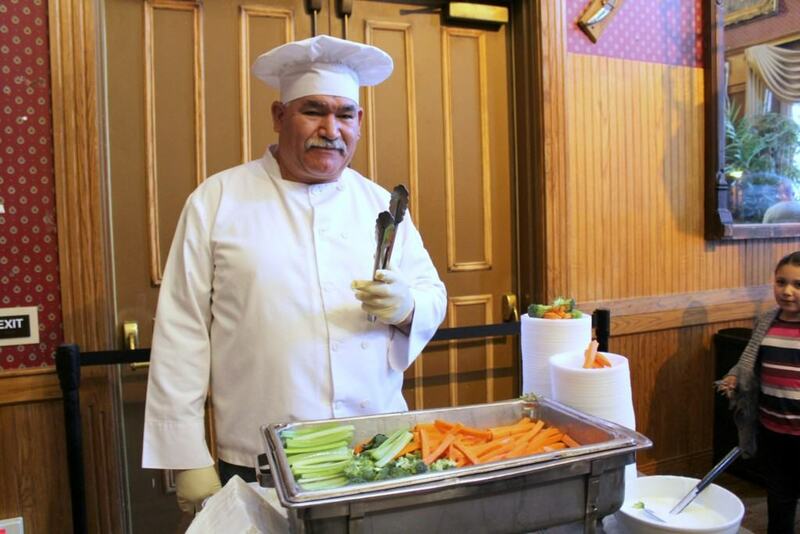 A daily breakfast buffet is available for an additional charge at the Knott’s Berry Farm Hotel. 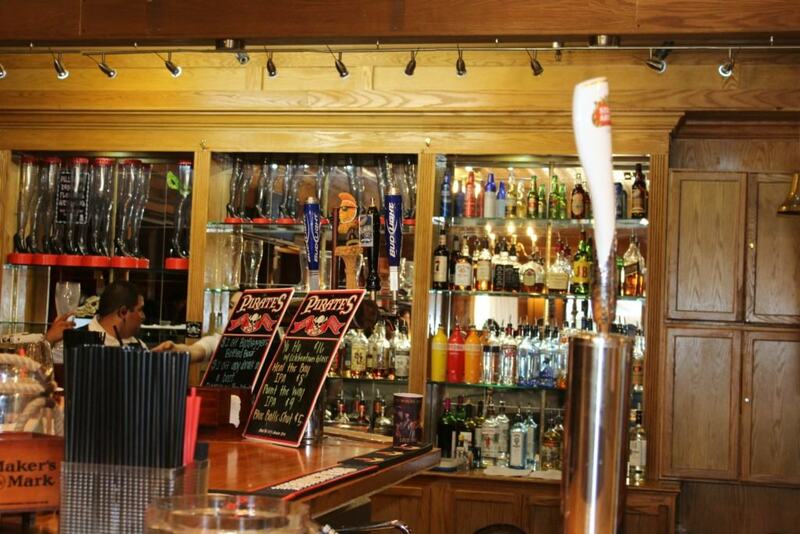 Amber Waves Restaurant and Bar serves American cuisine all day and features a daily visit from the character Snoopy. One of our bestsellers in Buena Park!Located less than 2 miles from Knott’s Berry Farm Amusement Park, this hotel offers comfortable accommodation, friendly service, and is located between motorway I-5 and I-9. The Good Nite Inn Buena Park ideally places guests moments from many popular points of interest. 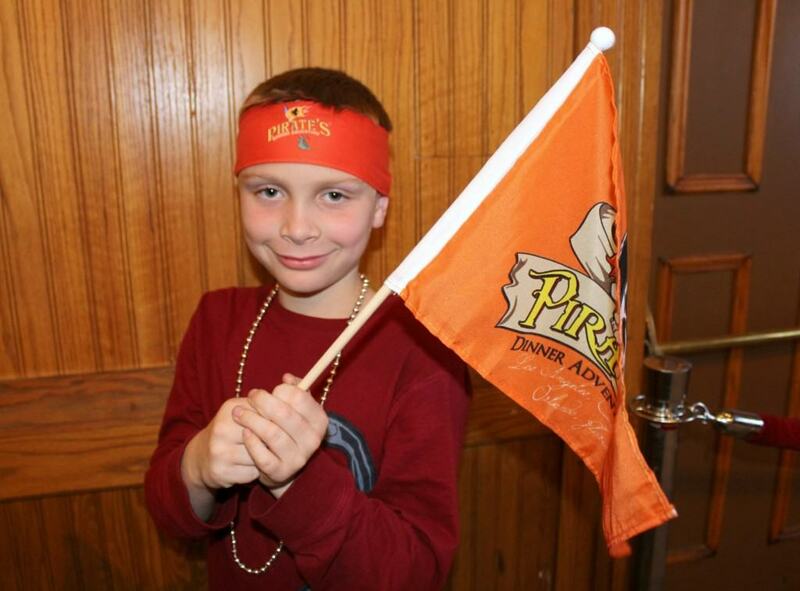 Disneyland, Soak City Water Park and the Pirates Dinner Theater are a short drive away. Guests at the Buena Park Good Nite can start the morning with coffee or tea at the lobby area or visit the hotel’s concierge desk to find information about the surrounding area. Only 1 miles from Knott’s Berry Farm and Soak City, this Buena Park hotel features an outdoor pool and free Wi-Fi. Disneyland Theme Park and California Adventure Park are 6 miles away. A flat-screen TV, microwave, fridge and coffee maker are provided in all rooms at the Fairfield Inn & Suites Anaheim Buena Park/Disney North. Each room is decorated in bold colors and includes a work desk and sitting area. Free access to the fitness room and the outdoor hot tub is provided to all guests. The front desk staff is available 24/7. The Anaheim Buena Park/Disney North Fairfield Inn & Suites have a continental breakfast each morning. Knott’s Berry Farm theme park is just over one mile from this hotel, and La Mirada Golf Course is 4 miles away. The John Wayne Airport is a 20-minute drive from the hotel. Featuring free shuttles to Disneyland theme parks and only minutes from Knott’s Berry Farm amusement park, this hotel provides on-site dining options and spacious rooms with free wireless internet. Every stay at the Holiday Inn Buena Park is sure to be enjoyable with amenities such as a spacious outdoor pool and modern fitness facilities. In addition to in-room coffeemakers, the hotel also serves breakfast, lunch and dinner at Ventanas restaurant. With on-site car rental services, guests at the Buena Park Holiday Inn can easily discover nearby attractions such as Soak City water park, the Anaheim Convention Center and beautiful beaches. The completely non-smoking hotel also offers free shuttle service within a 5 miles radius. Located a 5 minute walk from Knott’s Berry Farm, this hotel features a year-round sparkling outdoor pool and a daily hot breakfast. Free Wi-Fi and free guest parking are also provided. A 40-inch flat-screen cable satellite TV with DirecTV channels is provided in each air-conditioned guest room at Best Host Inn. For convenience, rooms include a microwave, a small refrigerator and a coffee machine. A 24-hour front desk greets guests at the Best Host. Offering Disneyland tickets, a virtual tour desk is on site. A guest laundromat is available. Free shuttle services to Disneyland and the Anaheim Convention Center are available. Soak City Water Park is a 4-minute walk from this hotel. Disneyland is 8 miles away.